** - Prior to January, 1998, US 278 terminated at US 45 near New Wren, MS, having previously duplexed with US 45 to Tupelo. In early 1998, AHTD requested and received approval to sign a US 278 extension across former AR 4 to Wickes, AR. While this extension exists on MDOT planning maps, it is not yet signed in Mississippi, even after 6.5 years. US 278 was first created in the early '50s. 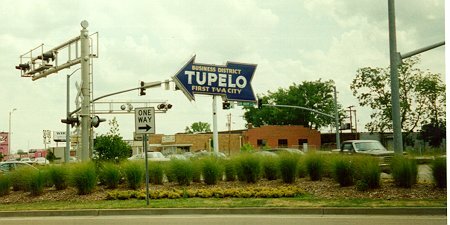 From then until sometime in the 1970s, its western terminus was here in Tupelo, at what used to be the US 45/US 78/MS 6 junction (now MS 6/MS 145). Photo by Adam Froehlig. In the '70s, US 278 was truncated to this point at US 45/MS 41 near New Wren, MS, and this remained its western terminus until early 1998. While Arkansas was quick to sign its part of the US 278 extension, Mississippi still has yet to do so. Photo by Adam Froehlig.